Patricia Lou (McKnight) Irving, 85, was called to her Heavenly Home on July 16, 2018. She passed away peacefully surrounded by her loving family at her home at 7440 J Road (Flat Rock), Gladstone. Pat was born on October 17, 1932 to Elisher “Jim” and Laurencia Eagle McKnight in Gladstone, the sixth child in a family of 10 children. She graduated from Gladstone High School in 1950. Pat married the love of her life, Charlie Irving, on February 17, 1951 at Bethany Lutheran Church in Escanaba. She also became a Child of God thru baptism on their wedding day. They became the proud parents of 8 children, 17 grandchildren, 22 great grandchildren and 1 great – great granddaughter. 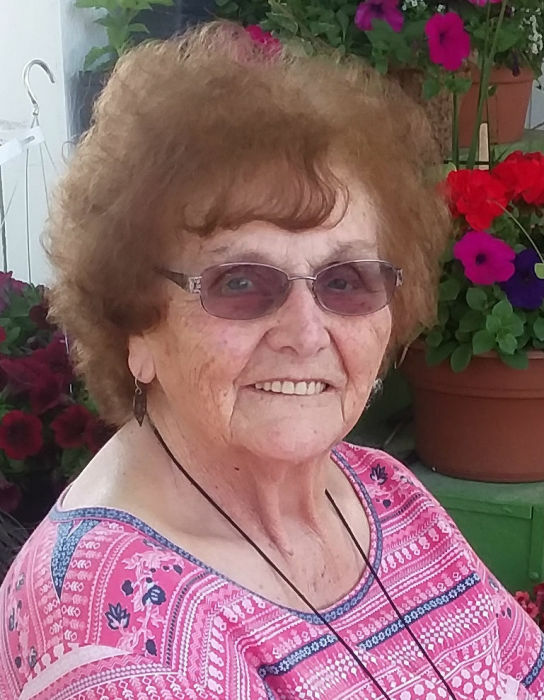 Throughout her adult life, Pat was a wonderful cook at several restaurants in Gladstone and Escanaba….from the Busy Bee Café and Stella’s Restaurant in Gladstone, to Tim and Sally’s Restaurant, Vahn’s Dinner and Crispigna’s Restaurant in Escanaba. At Vahn’s Diner in Escanaba, she was one of the first cooks to take an oath not to reveal the recipe for Kentucky Fried Chicken which was then only served as a “side” menu to the regular restaurant fare. Her love of cooking was evident in every meal she made for her family and in her career. That love of cooking has been passed down to four generations of professional cooks including her daughter, granddaughter and great-grandson! Her natural love for children played a vital part in her life when she became a bus driver for her brother’s business (McKnight’s Transportation) transporting students to and from the Learning Center. To the day she left us, she would receive Facebook messages and greetings from many of the “kids” she transported. The love she had for them was matched by the love they had for her. Patricia was a charter member of Christ the King Lutheran Church where she also enjoyed being a member of the ladies dartball team. She LOVED to play Bingo and looked forward to her Tuesday night Bingo games at the Gladstone Senior Citizen Center and she enjoyed going to the Casino. Pat was an avid Green Bay Packer fan and was fortunate enough to attend several games with her sister, Clara, in the V.I.P. boxes. Every Sunday afternoon, you could find her dressed in her Packer shirt and hosting Packer parties for her family! Throughout the last ten years of her life, she experienced many health issues but she never complained. She enjoyed life to the fullest and especially with her family…the most important thing in her life. She was always the heart of her family and she will be cherished and missed so very much! In addition to her parents, Pat was preceded in death by her husband, Charlie; brothers, Arnold Eagle, and LeRoy MacKnight; and sisters, Marion Leisenring and Doris Scheuren. Visitation will be held from 3:00 p.m. to 6:00 p.m., Thursday, July 19, 2018 at the Anderson Funeral Home in Escanaba. Funeral services celebrating her life of Pat will follow at 6:30 p.m., Thursday, at Christ the King Lutheran Church in Escanaba with Rev. Chris Johnson officiating. A luncheon will be served afterward in the church fellowship hall. Burial will take place in Lakeview Cemetery.